Can’t I just wall mount and install my plasma/LCD by myself? Mounting a flat panel on the wall with the least possible damage to your wall requires careful examination of the wall structure, studs, TV and other elements. This complicated process requires engineering and audio video expertise and precision tools for a proper and safe installation. Click here for some examples of some self-done (unprofessional) installations. How long will the installation process last? Depending on the location, it usually takes between two and three hours for complete installation and component set up. We will not leave without completing the job. How many people work on an installation? Usually business owner Peter and one of his assistants are present at the installation site. How many TVs have you already installed? Crystal Audio Video Design has completed more than a 1000 flat panel, wall-mount installations. Are there any hidden costs I am not aware of? No, all costs are presented to the client in a clear and fair fashion. If new costs arise during the installation, the client will be informed and asked to approve additional costs before any extra work is done. During the installation, will my wall be damaged? Our expertise is focused on the least possible damage to your wall as part of our non destructive procedures. You will be amazed how clean our work actually is. How secure is the wall mount ... will my TV fall down? Before the TV is physically attached to the wall unit, a weight test of five-plus times the TV weight is applied to ensure maximum stability and safety of your TV. I want to move to a new place ... can you uninstall and reinstall my flat screen? Absolutely, and with great pleasure, we will remove and transport your flat screen to the new place for free, if you decide to use our service for reinstalling the flat screen at your new location. How long will the setup, component calibration and customer education last? Setting up, connecting, and calibrating components to your TV can take up to one hour depending on system complexity. Education time varies between 10 to 20 minutes. I have a problem with my picture/sound. Can I call you? Can you help me? Our services also include Component Integration Assistance ... give us a call we’ll come and help you. I want my plasma/LCD flat screen on a pillar, brick or concrete wall. Can you do it? Yes we can. We have installed numerous flat screens on pillars and various wall types. How do you guarantee quality of your work? TV and all components will be left in working condition. We stand behind the quality of our service. If, however, a problem appears, and we establish direct responsibility for its cause, we’ll fix it free of charge. You are welcome to pay in cash, by cheque, debit, or credit card (Mastercard, Visa, or American Express). I got a cheaper quote from someone else. Why is your service more expensive? Our service is individually designed for the specific needs of each customer. Every installation is unique due to the individuality of your home / business. Our prices are a result of balancing the work complexity, our custom approach, and the 100% customer satisfaction guarantee we have to strive for to successfully finish every project to our standards. CAVD is a group of professionals with expertise and hands-on experience in multiple fields (engineering, construction, signal distribution, audio video design, sound engineering, wiring, cable termination, recording, computer integration, component fine tuning ... and many others), which makes our company truly unique, and our customers extremely satisfied (visit our testimonials section). Having an electrician or a carpenter install and set up your home entertainment system will simply not bring you the dream solution you deserve. I’ve tried to install my flat panel by myself unsuccessfully. I’ve damaged the wall (cut a huge hole, severed the studs, etc) in the process. Can you help me? 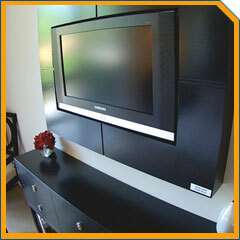 Yes, Crystal Audio Video can properly wall mount a TV even on a damaged wall structure. However, our specialty is a non-destructive wall installation that takes engineering, weight displacement ratio and other aspects into consideration. Therefore, it takes a lot more to fix installation errors after the wall structure has been compromised. And the cost of such installation is usually much higher. For those reasons, we strongly recommend that you don’t attempt the installation process yourself. I want to buy a new plasma/LCD TV, but I am not familiar with this technology. Can you help me? Yes, we do offer consultation services as part of our Complete Solution service. We will guide you all the way to ensure the best possible system for your home or business. I did not purchase all the necessary components for my entertainment system. Can you supply them? 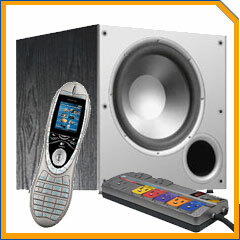 Crystal Audio Video Design also provides sales of audio video accessories and components. We can provide you with all necessary components or accessories. Please see our sales section. Do you sell audio video equipment? Yes we do sell selected products and accessories. Please see our sales section. If my cables are not long enough, how will you solve this problem? Crystal Audio Video can customize your current cables, or provide you with new ones on the spot! Can I record High Definition channels? Yes, it possible to record HD channels. However, the user must have approved Personal Video Recorders (PVR Units) that are supplied by the HD cable providers (such as a SHAW PVR box). All of the HD channels are coded in such a way that they can not be recorded on an external recording device. Why are some cables so expensive (over $100)? Do I need them? Some cables are more expensive as they provide a better connection between components using expensive materials such as gold, for example. If you are connecting high end equipment, using cables of higher quality is definitely recommended. What is a power surge protection and does my system need it? Power surge protection safeguards your appliances from electrical surges that can damage them. Power surge protection is recommended as a sound investment to protect your HDTV and higher end components. How long will my new plasma/LCD flat screen last? Industry claims suggest your plasma/LCD flat screen will last between 30,000 and 60,000 hours of operation. It depends upon your daily hourly usage as well as how you use the TV. This is anywhere from 12 to 55 years, according to standardized calculations. An extended warranty will give you a peace of mind. It is a small price to pay for not having to worry about your $5,000-plus equipment. I bought a new plasma/LCD and on most channels the picture is not as sharp as I saw in the store? In the store, display TVs often use an HD computer-generated picture. If you don’t have a high definition signal source, you will never reach the level of picture quality you saw in the store. Why are my rear speakers not loud like the front and center speakers of my home theatre system? This is because the speakers are set for a surround sound audio source (from a DVD that is recorded in surround sound for example), not a stereo source where all speakers (usually left and right) are the same volume level. However, is it possible to set all 5 speakers of your surround system to sound like stereo (same volume level). Which is the better system, cable or satellite? Both systems have their advantages, depending on the channel choice and possibility of mounting a dish. How I can clean my plasma/LCD screen? There are various special products that you should use to maintain the purity of your screen. Check out your local electronics store. I bought an HD plasma/LCD. Can I watch DVDs in high definition? HD DVD is a relatively new technology that is just getting popular. Unless you have a high definition DVD player and a high definition dvd disc (just coming out), the answer is no. However, there are DVD up converters that will convert the picture resolution from 500 to some 700 lines, enhancing your picture. Can I use one remote control for all my components? Yes, there are programmable, all-in-one remotes that can be used to control all your components. 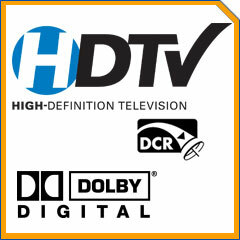 What is High Definition TV? It is the broadcast of television signals with a higher resolution than traditional formats (NTSC, SECAM, PAL) allow. HDTV has 1080 lines (resolution) while a regular TV has about 500 lines. Regular DVDs have roughly 500 lines. What is the difference between composite, component and HDMI connections? HDMI has gives a higher connection quality with all digital video and audio connections in one. What is a (digital) optical connection? An optical connection connects two components via a fiber-optic system. A fiber-optic system is similar to the copper wire system that fiber-optics is currently replacing in the industry. Fiber-optics use light pulses to transmit information down fiber lines instead of using electronic pulses to transmit information down copper lines. Ultimately, the digital coaxial connection is the most efficient way to transmit audio and video signals. What is a (digital) coaxial connection? It is a connection between two components via coaxial cable. The digital signal is transmitted via a type of wire that consists of a center wire surrounded by insulation and then a grounded shield of braided wire. The shield minimizes electrical and radio frequency interference. This is the primary cabling type used by the cable television industry and is also widely used for computer networks, such as Ethernet. It is a connection that is much less susceptible to interference and can carry much more data. What is a 3-2-1 sound system? It is a compact home theatre or a music (and radio) system that comprises two speaker units and one subwoofer. The two speaker units will emulate surround sound without the need for rear speakers. Technically it is a surround sound system with less complexity, fewer speakers and no wires running to the back of the room. What is a sound bar and can it replace standard 5.1 system? A sound bar is a system of multiple speakers (tweeters) in one bar that will simulate surround sound without the need for rear speakers. In most cases, if you don’t want to have rear speakers, sound bars represents an excellent alternative to the standard 5.1 system. What’s the difference between EDTV and HDTV? What is a picture resolution? What is the difference between the 4:3 and 16:9 aspect ratio? Refresh rate refers to the rate of speed at which a CRT monitor screen image refreshes or "redraws" itself. If the refresh rate is 60Hz, the screen will refresh itself 60 times per second. The refresh rate impacts a monitor's perceived image quality. If a CRT monitor is refreshing at a slow rate, the picture will appear to pulsate or flicker -- a situation that is uncomfortable for the user and can lead to eye fatigue. MPEG-1: Initial video and audio compression standard. Later used as the standard for Video CD, and includes the popular Layer 3 (MP3) audio compression format. MPEG-2: Transport, video and audio standards for broadcast-quality television. Used for over-the-air digital television ATSC, DVB and ISDB, digital satellite TV services like Dish Network, digital cable television signals, and (with slight modifications) for DVDs. MPEG-3: Originally designed for HDTV, but abandoned when it was discovered that MPEG-2 was sufficient for HDTV. MPEG-4: Expands MPEG-1 to support video/audio "objects," 3D content, low bitrate encoding and support for Digital Rights Management. Several new (newer than MPEG-2 Video) higher efficiency video standards are included (an alternative to MPEG-2 Video), notably, Advanced Simple Profile and Advanced Video Coding. MPEG-7: A formal system for describing multimedia content. MPEG-21: MPEG describes this future standard as a multimedia framework. MPEG-8: A future system for describing multimedia content for Stug's personal enjoyment.